Description: This map shows county lines and county seats current to the period, major towns and cities, and railroad routes and stations. The Township and Range survey grid is shown extending from the Tallahassee Base Line and the Tallahassee Meridian. The Townships are subdivided into sections, and those sections offered for sale by the land department of the South Florida R.R. Company are shown in orange. Map scale is 1:633,600. The map also shows the route of the Plant Steamship Line from Port Tampa to Key West and Havana carrying U.S. Mails. 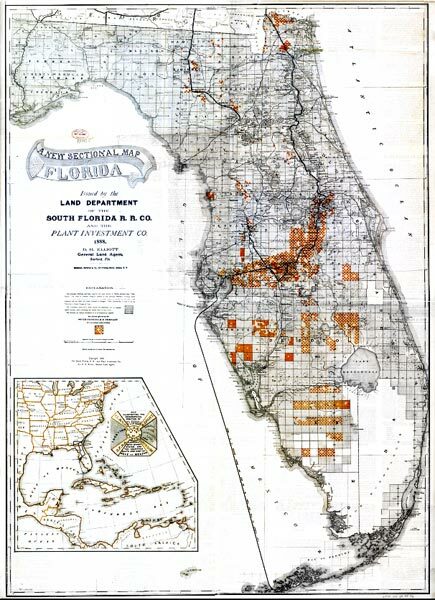 The inset map shows the geographical position of Florida with connecting railroads and steamship lines "for commerce with other states, and the countries south and east of Gulf of Mexico."